First of the Pair-a-Thon prize Pin-Ups (I am doing these at random XD) for….CAITLIN! 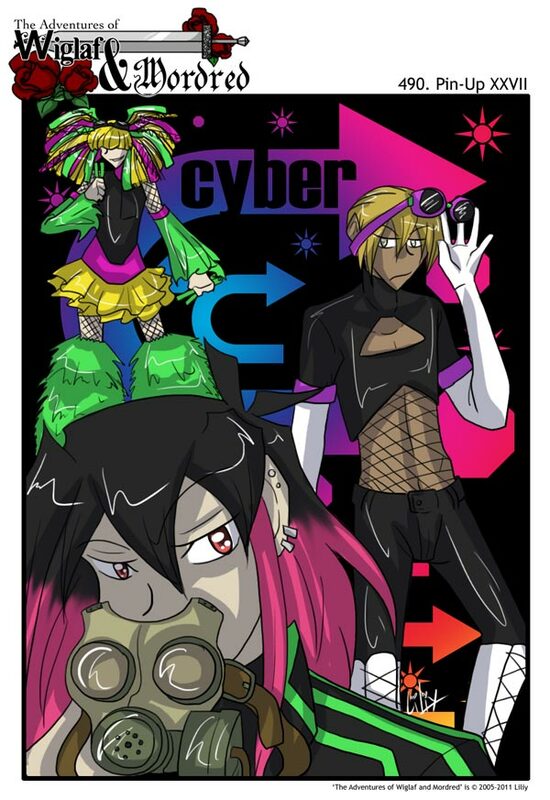 She wanted Cyberpunk style Mordred, Wiglaf & Driver with Gas masks, neon, mesh, & goggles. So…there ya’ go. I’m going to go pass out now. She has tons of stuff to work into canon. Driver really does look like some kind of crossdresser. You crazy fool, you’re not supposed to say that where Driver could hear you, run if you value your life! I’m loving this XD the colors! i love the gas mask. I know I didn’t win but I thought of an epic one for a pin up. Ok so Mordred as James Bond with a hat-less blond Driver as one of the Bond girls. That would be cool.